A lattice point is a point whose coordinates on a rectangular coordinate system are integers. 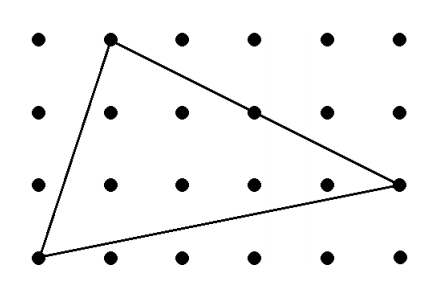 An interior lattice point is a lattice point that is inside a given polygon and not on its boundary. For example, the drawing below shows a triangle having six interior lattice points. The input starts with an integer N (0 ≤ N ≤ 255). This is followed by N input cases. Each input case is a list of six unsigned integers with values not exceeding 100. The six integers xA yA xB yB xC yC correspond to the coordinates (xA, yA), (xB, yB), (xC, yC). For every input case, print the number of interior lattice points in one line.